Bulk solids education in America gets a home this month with the opening of the Bulk Solids Innovation Center in Salina, KS. The Kansas State University Bulk Solids Innovation Center is the first facility dedicated to bulk solids research and education in the U.S., and is expected to serve as a research facility for a field that does not have much academic support. The two-story 13,000-sq-ft building will feature five laboratories for university and private research and includes test areas for vacuum and pressure dilute phase, vacuum and pressure vessel dense phase, batch weighing, gravity flow, air filtration, mixing, and more. 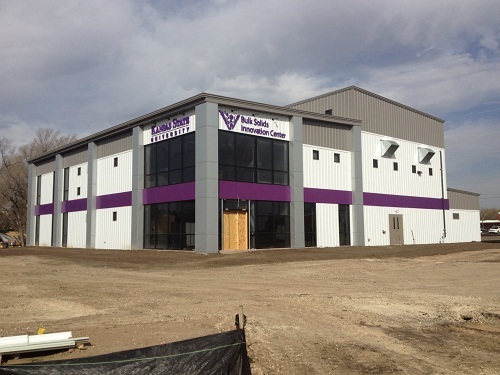 Two bulk solids equipment manufacturing companies, Coperion K-Tron and Vortex, which both have Salina-based offices, will cohabitate the building with Kansas State staff, with some level of cooperation expected between the companies and the university. The center received more than $2.5 million in equipment donations and featured contributions from several partners, including the Salina Chamber of Commerce, the U.S. Department of Commerce Economic Development Administration, the state of Kansas, the city of Salina, private companies, and Salina Economic Development Corp, the building’s owner. But most importantly to the university and the field of bulk solids is the education and research that the center is expected to provide. Kansas State University already provides some instruction in the bulk solids area but the facility is expected to provide more hands-on, real world instruction. Consultants and KSU will teach courses, but the Center can now provide the hands-on training that is absent in a lot of bulk solids coursework. “(Students) can walk out the door and go into the next room and see and feel the equipment,” Smith said. Find out more about the latest in Powder & Bulk Solids technology and equipment at Powder Show Canada June 16-18, 2015 in Toronto, Canada. Initially the facility will likely be used less for research and more for training programs, according to Barnhart. Federal research money will be slower to materialize for this facility compared with contract work, he said. And the education and research provided by the Center will also assist companies both local and nationally. “You are going to have companies that come to Kansas State and say we need help with this,” said Mark Friesen, marketing director for Vortex. It can be difficult for companies to launch new products into the bulk solids industry without testing. The center will provide companies the ability to test products without spending a lot of time on research and development. “I think it will help innovate new ideas,” said Friesen. Friesen says the location of the Bulk Solids Innovation Center in Salina will have an enormous benefit to area companies. Now when Vortex and other businesses in the region are looking for new graduates to hire out of college, companies won’t have to look far. “For them to have that experience in handling dry bulk solids, that’s a huge plus for us,” said Friesen.